Lanzarote is one of the Canary islands off the coast of West Africa in Spain, it is known for its year round warm weather, beaches and volcanic landscape and is a popular holiday destination for many tourists each year who head to Lanzarote to enjoy the hot temperatures, beaches and many hotel complexes here. Little known to the majority of people though is that there is more to Lanzarote than sandy beaches and cocktails bars. The unique, almost lunar landscape on this island makes walking in Lanzarote a real treat and many people are now heading here not to ‘fly and flop’ on the beach but actually to come on an active, exploring holiday. 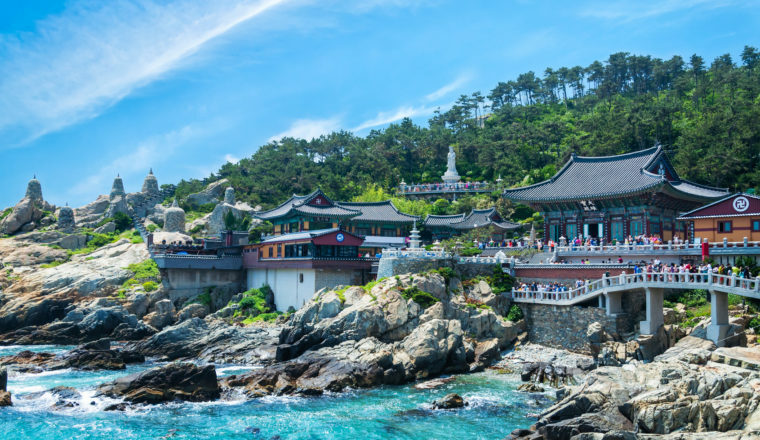 Unesco has designated the whole island a Biosphere Reserve which means that specific areas have to show that there is a strong historic link between man and nature. 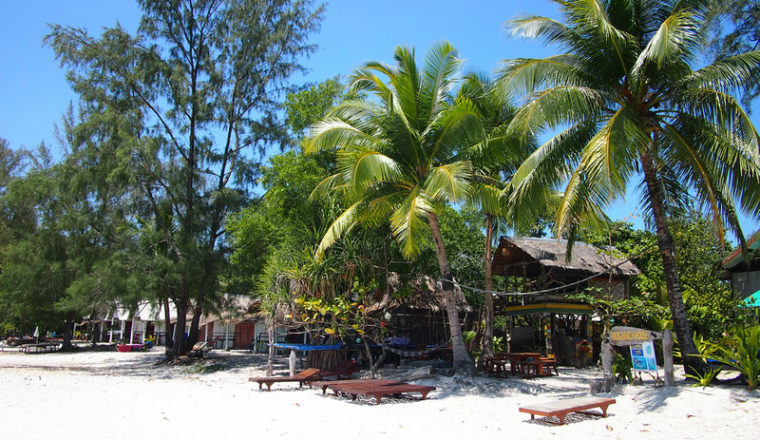 The locals have indeed helped to encourage the relationship between nature and humans, in turn keeping the island from being ravaged by the demands of mass tourism. 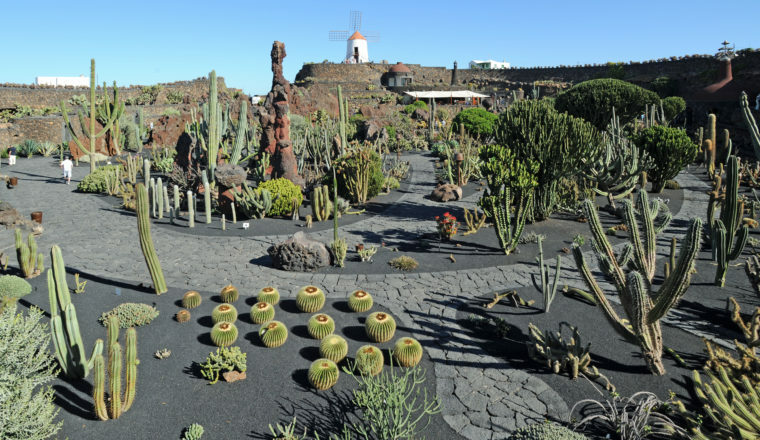 Examples include the ingenious way in which water and rainfall is trapped for agricultural use, such as the technique of planting vines in inverted volcanic ash cones in Geria creating the most unusual vineyards you’re likely to see anywhere on the planet. Don’t get us wrong there are parts of Lanzarote that are like every other Canary Island, but a lot of the island is largely untouched. 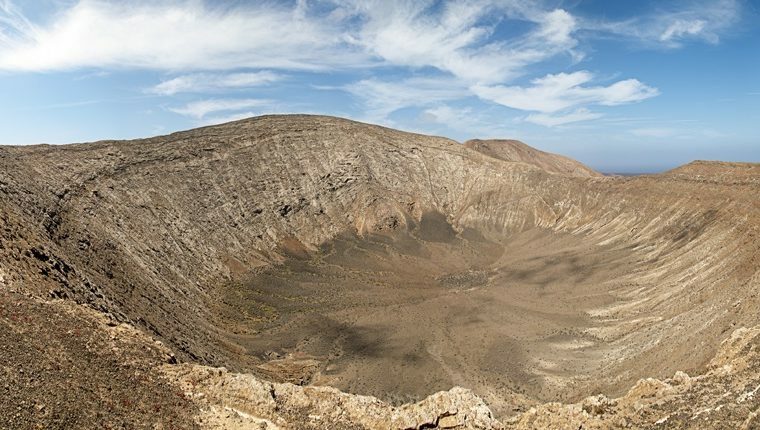 Walking in Lanzarote is an exciting experience but do keep in mind that the island is only around 100 miles from the Western Sahara making the sun fierce. 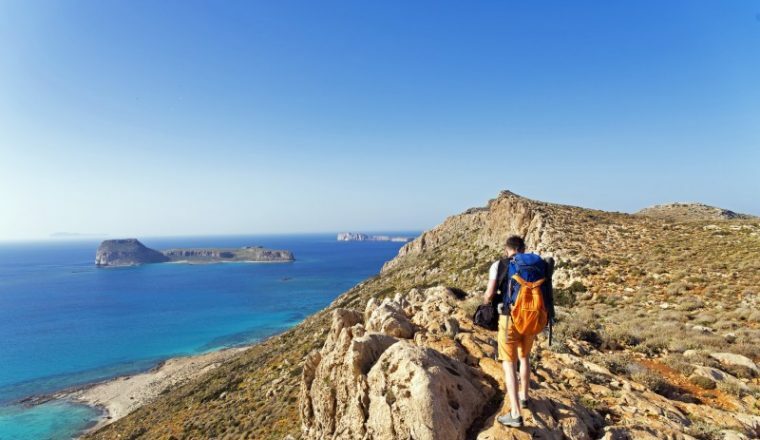 The island has virtually no trees so there is usually no shade to be had on walks so always carry water and suncream. At times a dramatic Sahara wind can blow across the island that feels like a hairdryer is being blown onto you. These unusual badlands are populated by over one hundred volcanic cones. A hike in this area can mean witnessing a bush explode above a red hot fumarole and watching water being spewed into the sky from a geyser. There is an entrance fee to access the area where you’ll find the Montanas del Fuego centre, but it is certainly worth the fee. Cesar Maneique was a Spanish artist, sculptor, architect and activist from Lanzarote. All of his creations are perfect for showcasing the harmonic relationship between man and nature including Los Jameos del Agua on the north east coast – a series of pools and volcanic grottos, the Mirador del Río – a classic Manrique styled viewpoint on the Famara Cliffs, the Monumento Al Campesino in Mozaga which pays homage to Lanzarote’s agricultural heritage and the Cactus Garden in Guatiza which is devoted to art and nature. Reached by ferry from Orzola, La Graciosa is a much lesser known Canary island and is populated by around 500 islanders. It is a desert island paradise where even the roads through the main town are sand. 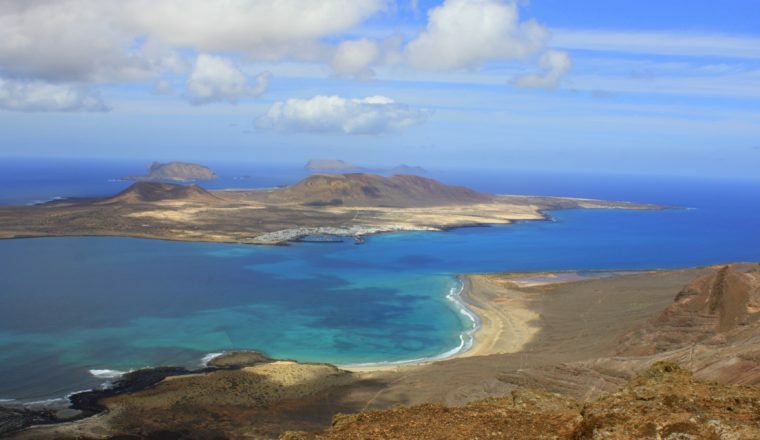 The Island of Alegranza is even more remote and is home to a 19th century lighthouse which shares the small island with nature and wildlife including a colony of Cory’s shearwaters, Barbary falcons and the occasional Egyptian vulture making it a fascinating spot to go walking in Lanzarote. If you have three to four hours to spare then definitely hike Caldera Blanca, the White Crater. Your only other companions are likely to be goats, as herders use this 1.15km wide volcano as a pasture. 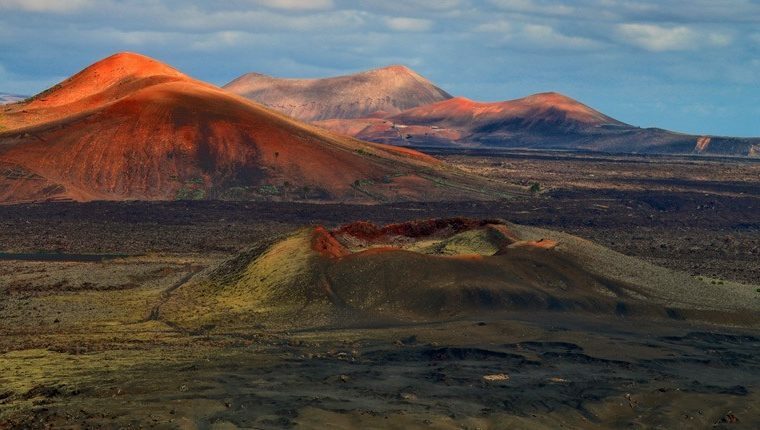 This is one of the lower volcanoes in the Parque Nacional de Timanfaya and it can be climbed with a fair degree of ease so is suitable for a variety of different walkers. 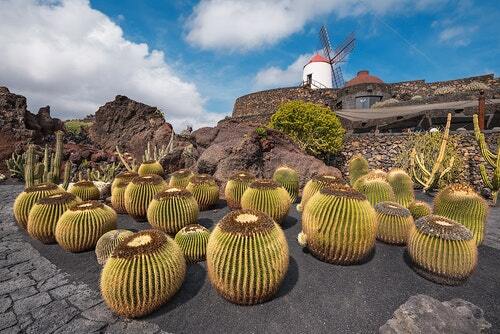 Located in the north west of Lanzarote, a beautiful drive from the capital Arrecife takes in San Bartolome, Monumento del Campesino, Masdache, and Mancha Blanca and takes around half an hour. 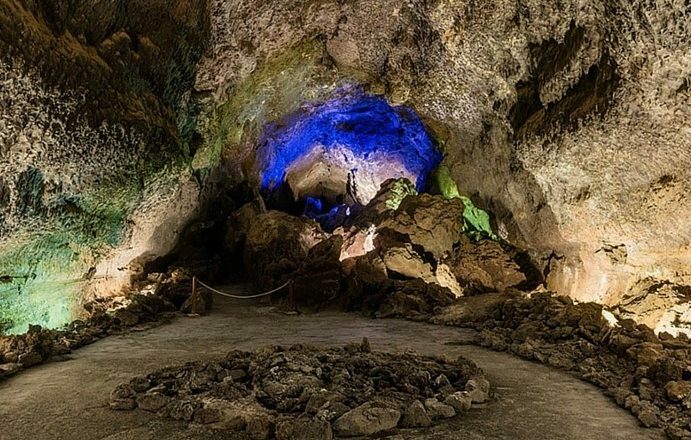 If you are walking in Lanzarote with family then this is a really child friendly hike and forms part of the 6km of volcanic gallery under the ground, one of the longest in the world which was formed by an eruption from nearby Monte Corona between 3,000 and 5,000 years ago. Agricultural Guatiza is where you’ll start and end this circular 27km tour. Because of the length of the tour and the incredible hot climate in Lanzarote then this route is best for the more experienced walkers. When walking in Lanzarote in Guatiza, you’ll pass through Tinguaton and Los Valles on the way, take in the panorama from the Mirador as you head towards Haria and you’ll also pass quaint hermitages such as the Ermita de las Nieves.